"THERE is a purpose of marriage between William Burnes, Bachelor, residing at Alloway, in the Parish of Ayr, and Agnes Brown, Spinster, residing in Maybole, in the Parish of Maybole, of which proclamation is made .. ."
When these banns were "cried" in the old church at the foot of the Kirkwynd in November, 1757, by the Rev. James McKnight (who in 1769 was Moderator of the General Assembly) none of the douce Minniebolers in the congregation that day could possibly know they were listening to the opening lines of a drama which would take its place in Scottish history. The menfolk in the congregation would, as usual, listen to the proclamation without actually hearing it and the bonnets of the goodwives would nod together as much as to say "A' well' she's got a man at last," it being common knowledge that Agnes Brown had broken off a seven yeais' engagement with a local ploughman, William Nelson, only a year earlier and now, at the age of twenty six, she was about to be married to an older man of thirty six from the neighbouring parish. It was in Maybole that the parents of Robert Burns met, courted and married and therefore the old town can claim a connection with him. Much has been written about his birthplace at Alloway, his father, William Burnes, originally from Kircardineshire (Clockenhill in the Means district) and his life from birth at Alloway to death in Dumfries but little has been mentioned about his connections with the old Capital of Carrick. Burns' mother lived in Maybole for most of her unmarried life and one of his greatest schoolboy friends, William Niven, lived in Maybole where Burns often visited him. Early in the eighteenth century a William Rennie (or Rainy), who was a baker in Ayr, decided to start a business in Maybole and he and his wife set up a small bakery in the town. On 7th May, 1731, their daughter Agnes married Gilbert Brown (born 1708) who was the son of John Brown, a farmer in Craigenton near Kirkoswald and a tenant of the Earl of Cassillis. At the time of his marriage Gilbert Brown was working as a forester on the estates of the Earl of Cassillis and it is said he set up house with his bride at Whitestone at Culzean and local tradition has it that their daughter Agnes was born there on 17th March, 1732. Whitestone was situated about two hundred yards south of Balchriston Gate Lodge at the entrance to the former Main Avenue to Culzean Castle. The gate lodge has completely gone now and only part of the gable of Whitestone stands in the wood-land at the south end of where the highway was straightened in 1965 to improve an awkward corner near the entrance to the Wrack Road which leads to Maybole shore. Shortly afterwards Gilbert Brown became joint tenant with his father in Craigenton Farm and Agnes Brown lived on the farm until she was about 12 years of age. She was the eldest of the family and had four brothers and three sisters when her mother died in 1742. Although then only ten years of age she took over the running of her father's house and she was helped in this difficult task by another girl, Ann Gillespie, who was only a year older than her and who became the wife of John Davidson, the immortal "Soutar Johnnie". Her mother on her deathbed had remarked to her sister, who had come to visit her as she lay dying, that she was not sorry to be going from the trials of this world and place at Alloway, his father, William Burnes, originally from Kircardineshire (Clockenhill in the Mearns district) and his life from birth at Alloway to death in Dumfries but little has been mentioned about his connections with the old Capital of Carrick. 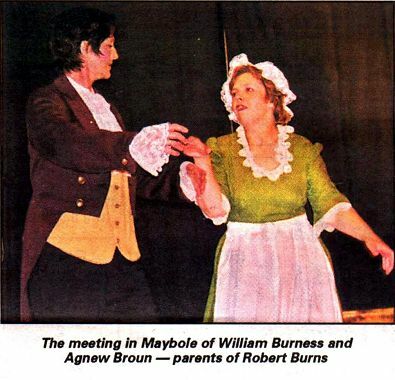 Burns' mother lived in Maybole for most of her unmarried life and one of his greatest schoolboy friends, William Niven, lived in Maybole where Burns often visited him. Early in the eighteenth century a William Rennie (or Rainy), who was a baker in Ayr, decided to start a business in Maybole and he and his wife set up a small bakery in the town. On 7th May, 1731, their daughter Agnes married Gilbert Brown (born 1708) who was the son of John Brown, a farmer in Craigenton near Kirkoswald and a tenant of the Earl of Cassillis. At the time of his marriage Gilbert Brown was working as a forester on the estates of the Earl of Cassillis and it is said he set up house she was leaving her children to the care of God as her husband Gilbert would soon get another wife. This prophecy was soon fulfilled for two years after his first wife's death, Gilbert Brown married again, and indeed after the death of his second wife married for the third time. On the marriage of her father to his second wife, Agnes, who had worked so hard to keep the family together, was no longer needed at Craigenton and she left and went to stay with her grandmother, Mrs. Rennie, in Maybole, which became her hometown for the next thirteen years. Prior to her mother'. ; death Agnes had been taught to read a little by a weaver in Kirkoswald but never received any tuition in the other two R's and knew nothing about arithmetic and could never write even her own name. This accounts for the fact there are no relies of any letter by Burns' mother but it is strange that such an inveterate writer as her son should never have written to her (at least there are no records of any such letters) or written a single line of poetry mentioning her. Neither is there any record of Burns ever visiting his maternal grandfather at Craigenton Farm although he lived in Kirkoswald for a time when he went to school there in his seventeenth year and Craigenton is only about two miles from the village. Probably the fact that his grand- father married again, and his mother was more or less cast out to live with her grandmother in Maybole, embittered Burns against the Browns. Differences between members of families were as common in his day as they are nowadays. When Agnes Brown moved to Maybole in 1744 she lived with her grandmother for some years and then became housekeeper to her paternal uncle, William Brown, who was a widower and who also lived in the town. Her grandfather, as well as being a baker, worked a small piece of ground near Maybole, (which was a common practice at that time) and had a man, William Nelson, to do the ploughing and odd work on the land. Agnes became acquainted with William Nelson and in 1749 they became engaged to be married. The engagement dragged on for seven years, which was an unusually long time in those days, but possibly Agnes did not wish to leave her widowed uncle to fend for himself. The seven years' engagement proved too much of a strain on William and in 1756 he became involved with another local girl who had his child and Agnes broke off her engagement. Shortly afterwards at the annual fair in Maybole she met her future husband William Burnes and the traditional site of this meeting is marked by a bust of the poet over a building near the bottom of Maybole High Street where it is said the fair booth stood at which they met. At this time William Burnes had been paying court to a girl at Alloway Mill and it is believed he had written a letter to her proposing marriage but had not plucked up enough courage to send it to her. After meeting Agnes Brown he transferred his affection to her and burned the letter to the Alloway Mill lass. After a few months' courtship, when no doubt William paid many visits to Maybole, the couple became engaged and were married on the 15th December, 1757, the bride being twenty six years old and the groom ten years older. After the marriage the couple took up home at Alloway and from thereon their life has been an open book to all, but few have mentioned that very probably many visits were paid by them and their children to Maybole to visit Agnes' grandmother with whom she had lived for so much of her unmarried life. It is understandable she would not often visit her father's home where a stepmother would probably not be too welcoming, but as Alloway is only five miles from Maybole no doubt the proud mother would visit her granny and childhood friends to show off her children, as all mothers do, and it can be assumed that Robert Burns in his very youthful years was often brought to the old town. When Robert Burns was seventeen years old his parents decided to send him to a well-known school in Kirkoswald where the headmaster, Hugh Rodgers, was noted as a teacher of trigonometry, land-mensuration and sun-dialling. Robert had shown a great liking far education and his father was anxious that every opportunity should be given him. The fact that he could send his son at the age of seventeen years to a school to learn mensuration, etc., should surely explode the myth that Robert Burns was a poor ploughman and his folks were in straitened circumstances. At that time country boys usually started work about ten or twelve years of age and whatever schooling they may have had was finished, and probably forgotten, by the time they were seventeen. During his son's formative years William Burns did everything possible to see he was given as good a schooling as possible and indeed in May, 1765, along with four neighbours started a school in Alloway, bringing a young lad of 18 years to tutor their children. Robert Burns did not attend this school long enough to gain much knowledge but undoubtedly he got his love of books and desire to further his education from his first tutor. This love of learning came to Burns not only from his father but from his father's father as he (Robert Burness) joined with some neighbours to build a school and employ a tutor on the farm of Clockenhill which is thought to have been the first school built in the Mearns district. It is not surprising therefore, with such a father and grandfather, that in the middle of the second half of the eighteenth century, when schooling in country districts was practically negligible, that Robert Burns should be sent to board at Kirkoswald and attend a school where such persons as the famous physician Sir Gilbert Blane (who discovered the cure for scurvy) and Sir Andrew Cathcart of Carlton were taught. The boarding of the poet at Kirkoswald was not a difficult matter as his mother's brother, Samuel Brown, lived at Ballochneil about a mile south of Kirkoswald Village and it was arranged Burns should stay there during the summer of 1775 when attending Hugh Rodger's school. The cottage in which Burns lodged is now a ruin with only part of the gables standing at the rear of Ballochneil Farm Cottages, on the farm of Park, about a mile south of Kirkoswald on the road to Turnberry. On the same day that Burns entered the school at Kirkoswald another pupil also enrolled and a friendship sprang up between the two youths. The other pupil was William Niven, who was born in Maybole in February, 1759, (a month after Bunts' birth) and he was the son of David Niven a well to'do merchant and Magistrate of the town. William Niven had just completed a course of classical studies in one of the schools in Maybole (of which there were quite a few at that time) but his father felt he should learn more about arithmetic, etc., to help him when be became a partner in his father's business in Maybole. During his schooling at Kirkoswald it is believed that Burns went nearly every weekend with Niven to his home in Maybole and stayed there from Saturday till Monday morning when they would both walk the four miles to Kirkoswald before school began. Burns therefore must have known Maybole well at this period of his life but naturally the townsfolk would never dream that the young lad who was such a constant friend of Bailie Niven's son, and who would be in many ploys in the town, as all young men were in these days as well as nowadays, would after his death, a short 20 years later, be immortalised as Scotland's National Poet. After Burns left the school at Kirkoswald he corresponded with his schoolmate for the rest of his shbrt life. Indeed it is said that his "Epistle to a Young Friend" was originally addressed to William Niven but as the Poet had become aware that "his early companion was pervaded with the single idea of how to become rich (or rather remain rich and become richer) he changed his original intention of connecting the effusion with the name of Niven." The two men were so opposite in nature it is understandable that, although Burns always retained a certain amount of friendship for his schoolmate, in later years he had certainly no deep affection for him and undoubtedly Niven's love of wealth was the cause of their drifting apart. The Poet and William Niven, however, regularly corresponded after their schooldays and when the first edition of Burns' poems was printed by John Wilson in Kilmamock in 1786 Niven undertook to sell some copies among his Maybole friends. The cost of a copy (3/-) was quite a lot to pay for a book of poetry in those days (about half a week's wages) but Niven managed to sell seven copies, presumably to some townspeople, and it is unfortunate for the descendants of the purchasers that none of the copies seem to have survived as they would fetch a great price today. Perhaps some fortunate Minnieboler may yet unearth a copy among the old and forgotten things so often stored away in the attics of the older houses in the town. In August, 1786, Bums came to Maybole from Mossgiel to collect the money for the seven copies of his poems and stayed the night with Niven's parents. A party of the poet's admirers (probably the purchasers of the books, among them being Hugh Podger his old Kirkoswald schoolmaster) met in the Kings Arms Hotel that evening and spent a most convivial night. She's damned puir, but he's damned canty." This is the last factual record of Burns visiting Maybole and on his returning to Mossgiel he wrote to his friend William Niven on 20th August, 1786, thanking him for the hospitality shown him and asking to be remembered to the people with whom he had spent the evening. He referred to "spunky young Tammy" (Thomas Piper, assistant to Dr. Hugh Logan in Maybole) also Mr. Dunn, a schoolmaster in the town, and particularly to "the two worthy old gentlemen I had the honour of being introduced to on Friday, although I am afraid the conduct you forced on me may make them see me in a light I would fondly think I do not deserve." In the letter he paid his respects to Mr. and Mrs. Niven who had been his hosts during his visit and stated that he had been so busy on his return to Mossgiel that he had not been able to fulfill a promise made to his school friend but asked William to remember the old proverb: "The break o' a day's no the break o' a bargain" and to have patience and the matter would be settled. What the promise was and if it was ever carried out is unfortunately unknown. Burns went on to write that every one of his Maybole friends was welcome to a copy of his songs but they were not to be "blazed among the million as I would abhor every prentice mouthing my poor performances in the street." Although possibly the Poet would again visit Maybole from time to time (at least before he went to Dumfries which was a distant part in those days) there is no record of any such visits but it can be truly said that the old town has many associations with our national poet and the chance meeting of William Burnes of Alloway and Agnes Brown at the booth at the bottom of the High Street in 1756 was the real beginning of the immortal story of Robert Burns. Maybole can also claim connection with another Scottish poet. The parents of the famous William McGonagall,. 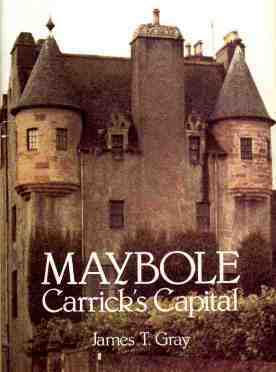 "the world's worst poet", lived in Maybole for many years and all their family, excepting William, were born there. They moved to Edinburgh and William was born three months after they left Maybole.